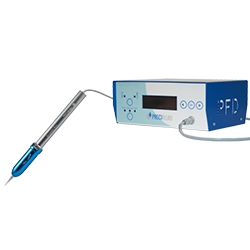 The Precifluid is a volumetric dispenser compatible with all sorts of fluids (from the most liquid to the most viscous ) combining velocity and accuracy. By the action of a linear step by step engine which makes the movement of a volume of product in a repetitive and checked way, this range goes beyond the limits of the pneumatic systems of dispensing (at least seven times more accurate) and allows deposit outstandingly smaller than most of the volumetric dispensers on the market with a minimum volume going to 0,06 microliters. This patented dispenser is the only one which can ensure you volumetric deposit with such a precision. Besides its exceptional performances, the use of the volumetric dispenser PreciFluid remains very instinctive. Sequenced by programs beforehand recorded, its pushes are regular and constant. You just have to enter the digital volume and the velocity which you wish to make the dispensing so that the dispenser handles calculations. 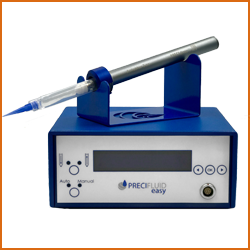 The Precifluid Easy is a volumetric dispenser suitable for all kind of fluids (from the most liquid to the most viscous) combining repeatability and accuracy. The “Easy” version is a lighter version of the Precifluid but remains more developed than a pneumatic dispenser. The Precidot is a small, ergonomic, volumetric removal tool that allows minimal and precisely repeated dispensing volumes. 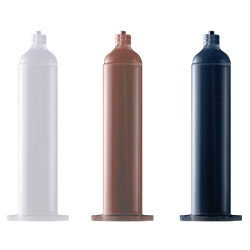 Poly Dispensing Systems offers Precifluid accessories for a wide variety of industrial applications. To improve your dosage, a range of Precifluid consumables has been designed to ensure the proper use of your Precifluid®.